With the revenue short fall and decline in the state budget, retirement issues will likely be on the Legislative agenda. AMRPE recommends members familiarize themselves with the candidates for fall elections. In addition, ask your representatives what their views are on retirement systems and benefits. Click here to Lookup your Legislator. The AMRPE Legislative Committee and our lobbyists from Browning, Kaleczyc, Berry & Hoven (BKBH) monitored potential bills that could affect our membership. Now that the Legislative session is closed here is the 2017 Legislative wrap-up and session bill breakdown. 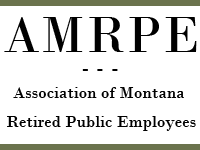 In the 2009 legislative session, AMRPE was successful in lobbying the Legislature to pass House Bill 315 which added an inflation index to the pension exemption on Montana income tax. Prior to this, exemption rates had not been changed since originally enacted in 1991. The inflation index benefits all retirees living in Montana. Because of the uncertain economic conditions of both the state and nation in 2011, no favorable retiree legislation was passed. However, AMRPE lobbying during the 2011 legislative session was successful in preserving public retirees current benefits. We introduced a bill to use coal tax revenue to shore up the PERS Trust Fund, which was used as a basis for the Governor’s HB 434 in the next Legislative Session. In the 2013 legislative session, AMRPE opposed and helped defeat all efforts to convert the Defined Benefits Plan to a Defined Contribution Plan. We introduced HB 382, which used a portion of coal tax revenues to fund the current PERS Trust Fund. This concept was used in HB 454, which did pass. We lobbied hard to remove any reduction to the GABA for current retirees in HB 454. We also lobbied to protect the Montana income tax deduction on pension benefits and to defeat SB 353 which would have substantially changed the makeup of the PERS Board. AMRPE successfully advocated for pension increases in the 1983, 1985 and 1993 legislative sessions. In 1997, the AMRPE Board successfully lobbied for passage of a 1.5% GABA –the first GABA in the history of PERS. In 2001, AMRPE successfully lobbied to increase the GABA to 3% and to provide a onetime increase to those who retired prior to 1982. Keep checking this website for updates!